Are we about to get a Wayne's World revival? Arriving in 1992, the first Wayne's World movie was nothing short of a phenomenon. The character was a break out on Saturday Night Live and hit the big screen in a timely fashion to capture that zeitgeist. The sequel, which arrived just a year later in 1993, didn't fare so well, and there was a lot of turmoil around the set, with Mike Myers said to be feuding with both the director and his co-star Dana Carvey. After just two movies, the saga was short lived for many reasons. But now, it sounds like Wayne might be gearing up for another big screen adventure. 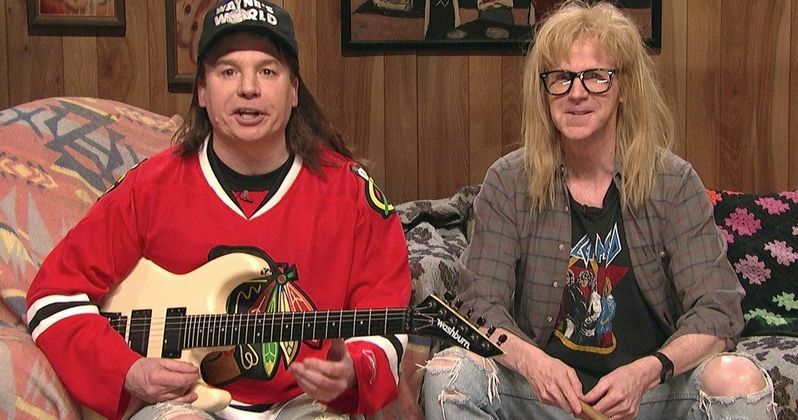 In the twenty-four years since Wayne's World hit theaters, Dana Carvey and Mike Myers have patched up their differences, and have even appeared together in character on SNL in the years since, including a very popular sketch they did for the show's 40th Anniversary special. Speaking with CTV, Myers revealed that he is considering putting back on the mullet wig and ball cap for another go. As he's interested on seeing what Wayne looks like this much further on in life. He states this about the possibility of Wayne's World 3. "It would be an interesting examination of Wayne at 50. I don't know what it would look like, but the idea of it makes me laugh and Dana (Carvey) and I had a blast at the 40th anniversary, so I don't know." Wayne's World will celebrate its 25th Anniversary next year, and we can expect to see something tied into the big event. It's quite possible that, even if we don't get another movie, Carvey and Myers will team up to appear on SNL again before the new season comes to an end next spring. And there will surely be some sort of anniversary Blu-ray released. The original movie will also likely get a theatrical re-release, even if it is just a one-night event, which could be used to test audience's taste for a sequel. Back in February, it was widely reported that one Canadian man really wanted Wayne's World 3 to happen, and even started his own crowd-funding campaign to make his dreams come true. Trevor Schindeler has spent over 23 years trying to get anyone to read his Wayne's World 3 pitch. He had this to say about the idea at the time. "Wayne's World, starring Mike Myers as Wayne and Dana Carvey as Garth, was released in 1992. Wayne's World 2 was released in 1993. Shortly thereafter, the plot line for Wayne's Leisure World came to mind and I felt compelled to write a synopsis. On July 7, 1993, I registered my work with the Writers Guild of American, West, Inc. Being young and naively optimistic, much like Wayne and Garth themselves, I assumed that I could get someone inside Fortress Hollywood to read my work. Surely, Hollywood is looking for great stories. I sent out query letters to everyone associated with the Wayne's World franchise including producers, directors, writers, and actors. I was stonewalled. No one would even read my synopsis." Perhaps Mike Myers finally took a look at that script? Who knows. It certainly sounds like we could be seeing Wayne's World 3 after all. Or, this could all just be a pipe dream. We have gotten a few long awaited sequels in recent years, such as Anchorman 2 and Zoolander 2. But if those prove anything, it's that sometimes old comedies don't need to be revisited. Perhaps Wayne's World will turn out to be a different kind of story?